Crowell, Floyd Roscoe – of Saugeen First Nation #29, peacefully at the Southampton Hospital on Monday, April 27, 2015 at 70 years of age. Devoted husband of Diane (nee George). Loving dad to Rob Price (partner Marsha Reany), Tania Ritchie (partner Scott Shular), and Eddie Ritchie. Grandpa of 11; great-grandpa of 2 (with 2 more soon to be born). 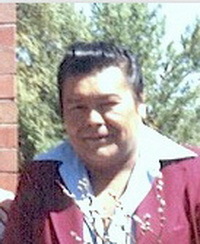 Brother of Roland (Verna), Elva John, Pearl Thompson, Tony, Rocky (partner Kyre), and Clayton (Nancy); and brother-in-law of Joe George, Brian George (Cheryl), John George, Priscilla George, Deb Mandawoub, Sharon George and Donna George. Sadly missed by many nieces and nephews. Predeceased by parents Don and Hazel; brothers Bill, Bert, Briley, and Gabe; sister Julia; 6 brothers-in-law; and 3 sisters-in-law. A service to celebrate Floyd’s life will be conducted 10 a.m., Tuesday, May 12 at the Wesley United Church. Interment in Sanctuary Park Cemetery, Port Elgin following cremation. Donations to the Cancer Foundation, Diabetes Foundation or Kidney Foundation would be appreciated and can be made through the Thomas C. Whitcroft Funeral Home & Chapel, Sauble Beach (519) 422-0041.